This option provides everything except the mat for those who already have a mat or are going to use any of our mats in stock or design their own mat to complete your frame package. 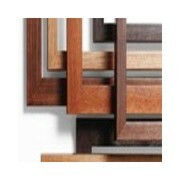 Your choice of wood or MDF frame fully assembled. .060 clear acrylic glazing is provided as is a back with hardware attached for hanging. The contents is loaded in the frame and held in place with flexible glazier points so you can add your mat and image. No additional purchase necessary. No tools required. 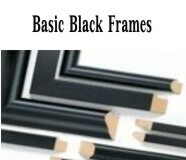 Custom frame shop quality black frames for the artist. If you have your own mat or want to use one of our stock or custom mats not already available matted in a frame, the Frame Kit is your answer. Our Black Wood Veneer Picture Frames come with everything you need except the mat. Frames are joined with modern joining equipment and all corners are traditionally glued...something often ignored by some vendors. MADE IN THE USA. No tools required. Perfect for the working artist. Wonderful, wonderful natural wood. If you have your own mat or want to use one of our stock or custom mats not already available matted in a frame, the Frame Kit is your answer. Our Natural Veneer Picture Frames come with everything you need except the mat. Frames are joined with modern joining equipment. All corners are traditionally glued...something often ignored by some vendors. MADE IN THE USA. No tools required. Satin Black MDF offers price and ability to get large frames with a smooth satin black veneer. If you have your own mat or want to use one of our stock or custom mats not already available matted in a frame, the Frame Kit is your answer. MDF Black Veneer Picture Frames come with everything you need except the mat. Frames are joined with modern joining equipment and all corners are traditionally glued...something often ignored by some vendors. MADE IN THE USA. No tools required.